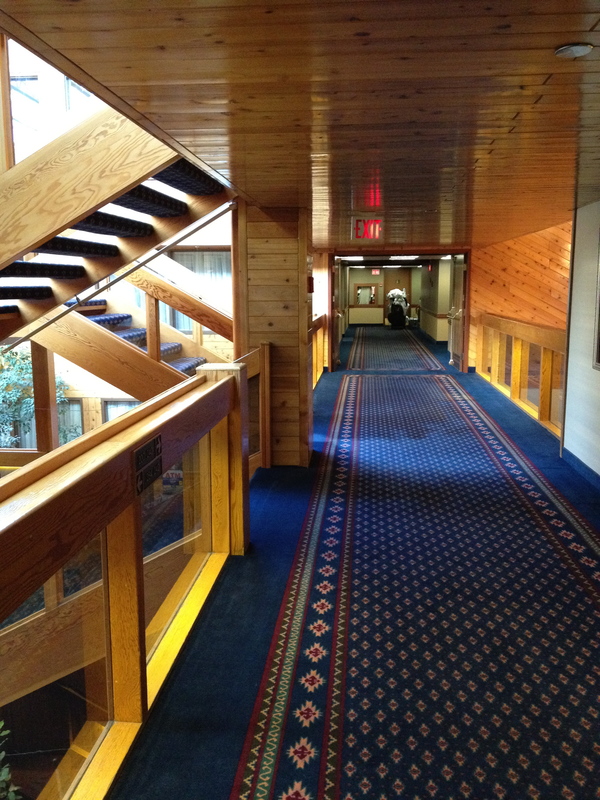 It is actually really difficult to find a wheelchair accessible hotel in Jasper, Alberta but the Sawridge Inn meets most of the important criteria. 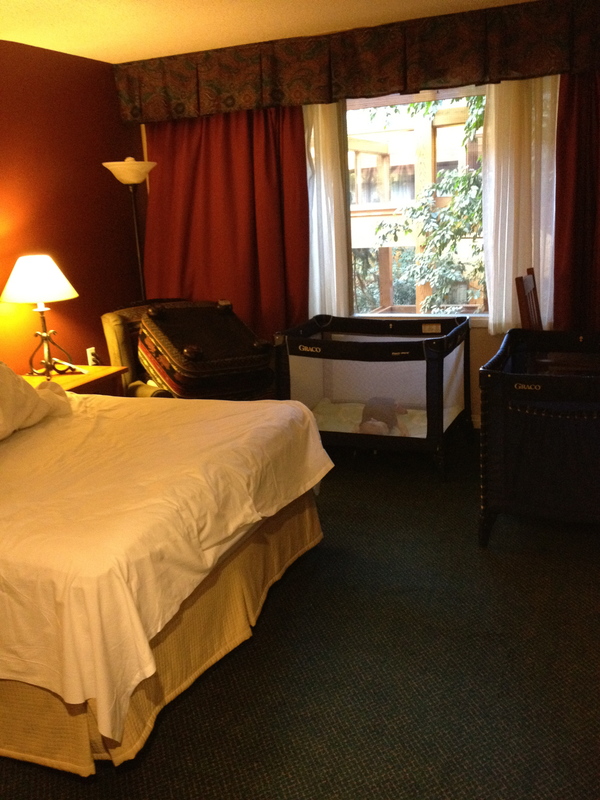 We stayed in room 279, which faces the interior of the atrium area on the second floor of the hotel. The bathroom in this room has been beautifully renovated, complete with a wheel-under sink, grab bars by the raised toilet and a wheel-in shower with a shower bench. 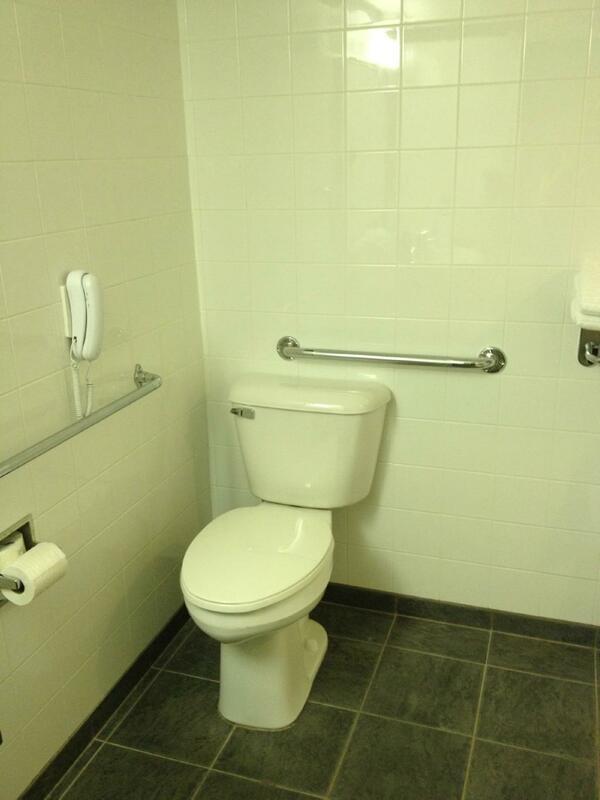 There is ample room to move around in this bathroom. 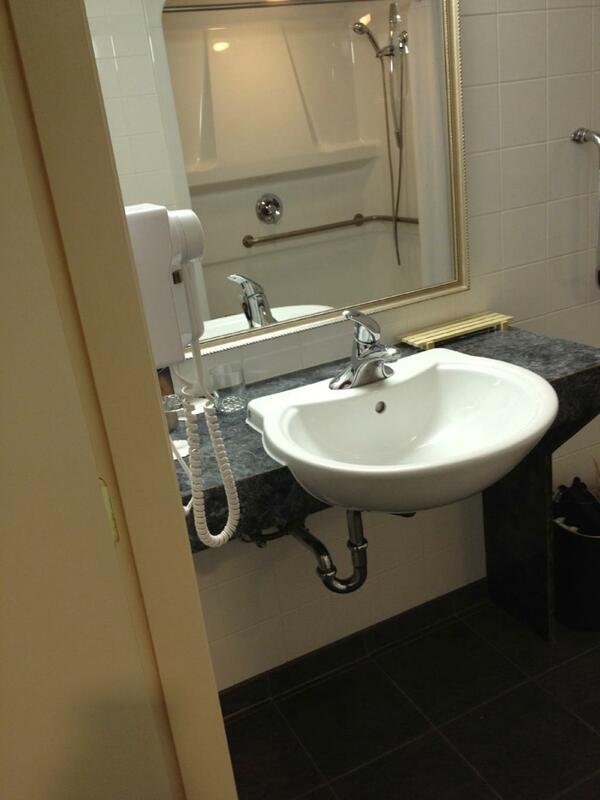 It was obviously recently renovated as it looks very modern and clean. The room is on the small side, but after we moved the ottoman out of the way, we still had enough room to set up two playpens for the babies. The bed is comfortable and there is a large TV. The room definitely has a cozy, rustic sort of feel to it. The lobby is accessible and there are elevators that will allow you to access the different floors. We stayed on the second floor, which is entirely non-smoking. 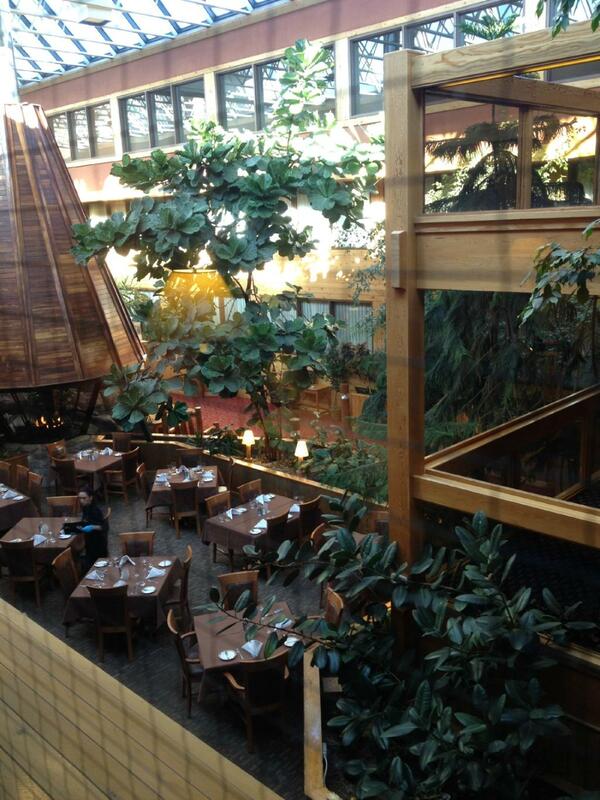 There is a nice atrium area in the centre of the hotel. Yes, it is a bit dated, but it gives the place a nice open feel. I believe the restaurants are all accessible (although we only tried one – Hearthstone Lounge – and the food was average for the price). 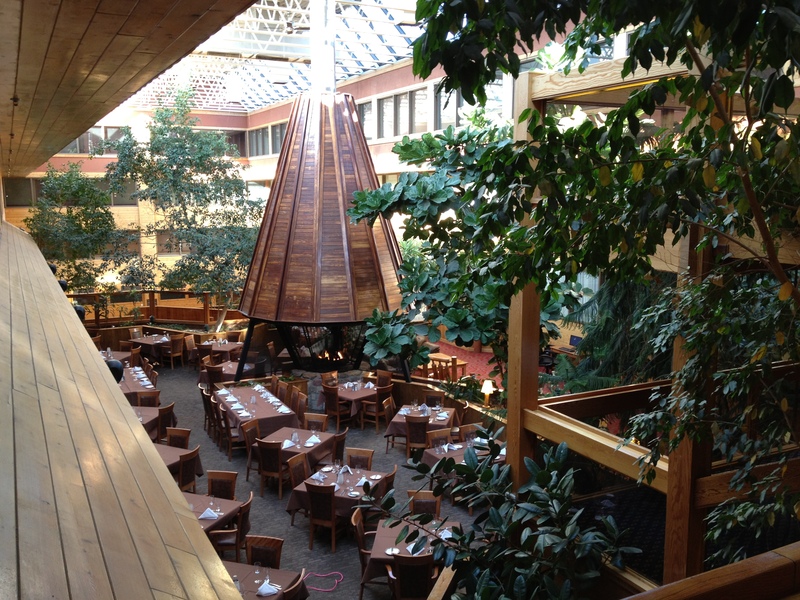 This hotel is the first one in a row of hotels as you enter Jasper from Edmonton. It is about a 10 minute walk to the main part of downtown, but it really doesn’t feel very far and we had no issues walking/wheeling there. The good thing about the location of this hotel is that there is nothing on the east side but wilderness and you might be more likely to spot some wildlife because of this. It also appears to be a very quiet location. 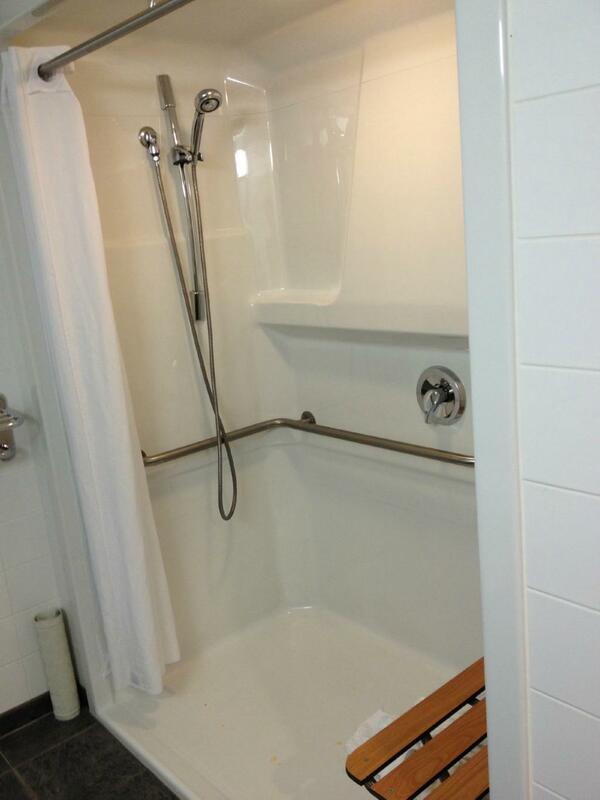 The only detail the bathroom overlooks is that the shower head is too far from the shower bench, so someone in a wheelchair probably cannot use the shower alone unless they place the shower head on the floor of the shower before they get seated and don’t mind that they can’t hang it up anywhere while they shower. The windows to our room faced the interior of the hotel. Because of this, we had to keep the blinds closed all the time because anyone walking on the stairs or walking down the hallway could see right into our room. Make sure you ask for a different view if this is not what you have in mind. I did not use the spa nor did I ask if the spa was wheelchair accessible but the fitness room is not accessible. It is a very small room without any room for a wheelchair to move around in. From an accessibility standpoint, the main drawback is that the pool, spa and fitness centre are down a big flight of stairs. If you are in a wheelchair, you can only enter this area through a back door to the hotel, however, there is no curb cut at the back (so be prepared to have to bump up and over the curb of the sidewalk). It is really unfortunate that this is the only wheelchair access to the pool area as it is a decent pool and hot tub – but who wants to have to go back outside and wheel around the entire hotel to the front lobby when they are in their swimsuit and wet from the pool! Overall, this hotel met our needs quite well. We wanted somewhere we could relax for a few days that had a good accessible bathroom. This hotel was quiet, clean and comfortable. If you have never been to Jasper before, be prepared that a number of the stores downtown are not accessible. The main street is older and most of the shops and restaurants have a few steps to get in. There is a newer street just behind the main drag though and most of the shops and restaurants on that street are accessible – including the candy store, which is AMAZING! This entry was posted in Alberta, Canada, Jasper and tagged accessibility, accessible, alberta, disability, grab bars, Jasper, manual wheelchair, paraplegic, special needs, spinal cord injury, travel, vacation, wheel-in shower, wheel-under sink, wheelchair by papawheelieblog. Bookmark the permalink.